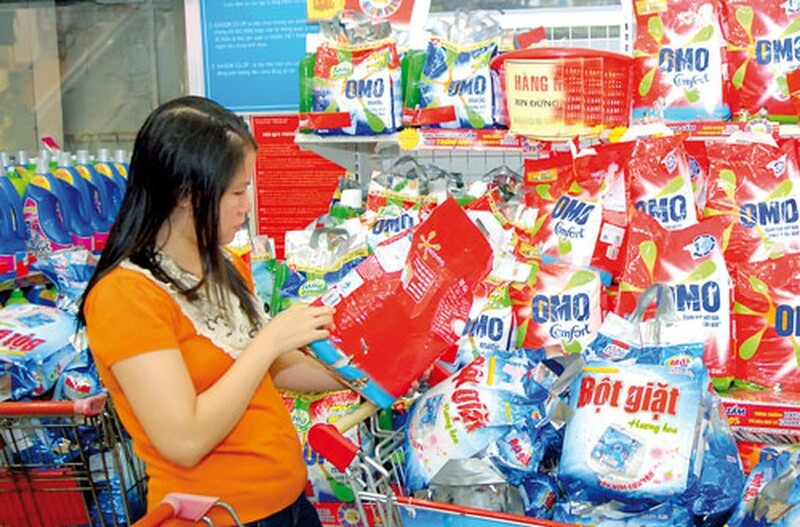 The detergent market in Vietnam has posted a steady growth in the past few years but has also seen an oligopoly, with more than 30 domestic manufacturers being gradually overshadowed by just two Foreign Direct Investment companies. According to figures by London-based market intelligence firm, Euromonitor, during the period 2006-2011, the detergent market showed robust growth with revenues rising from VND3.8 to VND7.3 trillion. Forecasts are that revenues will surge from VND7.5 to VND8.6 trillion during the period 2012-2016. In 2012, although the economy tumbled and purchasing power of consumers weakened, the detergent market still maintained a growth of 10 percent. According to forecasts, with a population of more than 90 million with increasing average earnings and steady demand for essential goods, there is still potential in the detergent market for businesses to develop. However, a few foreign companies have been dominating the market and collecting high yields while most domestic manufacturers are barely able to maintain market share. A report by the Vietnam Competition Authority under the Ministry of Industry and Trade showed that among 10 economic sectors, there were upto seven sectors facing oligopoly. Of which, the detergent sector saw the highest rate of oligopoly with market share belonging to two FDI companies, Unilever Vietnam and Procter & Gamble Group. During the period 2008-2011, Omo brand of Unilever dominated Vietnam’s detergent market with more than 65 percent market share and Tide brand of P&G followed with about 23 percent market share. The rest 12 percent market share was divided equally among imported and domestic brands like Daso, My Hao, Lix, Vi Dan and Duc Giang. On the other hand, while domestic detergent manufacturers overwhelmed foreign manufacturers by volume their product remained inferior in quality. Lix Detergent Joint Stock Company was seen as one of the 30 domestic companies that were competitive enough with foreign manufacturers. However, since 2000, the company has become a processor for Unilever. At that time, processing accounted for 70 percent of the company’s production and until 2011, despite the company’s efforts to expand business and increase products--the rate remained at 34 percent. In reality, the familiarity of Lix in the domestic market remained poor as its products were mainly exported to Cambodia, Philippines and Japan. Currently, the company has mainly distributed products in the south-west area for consumers of average-income segment. Meanwhile, other trademarks, including Daso, Vi Dan, My Hao and Bay, merely account for 5 percent of market share and were being overshadowed more and more in the domestic market. After winning most of market share in Vietnam, Unilever and P&G narrowed their manufacturing and hired smaller firms or local factories to process products for them. Without production pressure, these FDI companies concentrated on building their brand name and developing distribution channels. In order to survive, several Vietnamese detergent manufacturers had no choice but to process products for bigger firms. At first, they received many orders at high price so they rarely cared about building their own brand names. But when the economy slumped and consumption declined, their partners reduced orders. At that time, many firms wanted to gain back market share but it was too late. According to experts, products of Unilever and P&G are currently leading and determining consumer demand. Thus, domestic producers have to offer much lower price to attract consumers. In the market, the current price of local detergents such as My Hao, Bay, Net, Lix, Duc Giang and Vi Dan, was cheaper by 30-40 percent compared to that of Omo, Viso and Tide. Meanwhile, 50 percent of material to produce detergent is imported, causing many difficulties for Vietnamese manufacturers. Increasing price to make up for overheads not only loses them consumer confidence but also a slump in revenues. Unilever and P&G on the other hand are flush with liquidity and can import raw material. When local manufacturers face difficulties these companies present many new products lines to win consumers in the low-end segment and penetrate deeper into the rural market. Tran Phuong Lan, head of Competition Supervision and Management Department, said that with few firms dominating the market the competition is unfair, causing a loss to consumers and local manufacturers. Therefore, authorities should carry out inspections to eliminate oligopoly, create fair competition and help Vietnamese firms to grow in the domestic market.